Our Flat Top Delineator Tube is versatile and tough with a built in grip on top. 42" tall and made from brilliant orange LDPE Plastic (Low Density Poly Ethylene) these delineator tubes have built in UV stabilizers to prevent fading and keep the orange color bright for many years. There is a recessed area in the delineator tube to protect the optional 3" reflective 3M Prismatic Sheeting. Can be used in conjunction with a cone bar to make an easy to set up barrier. Our 8 lbs. recycled rubber base is standard, available with optional 12 lbs., or 18 lbs. recycled rubber base for demanding applications. Made in USA. 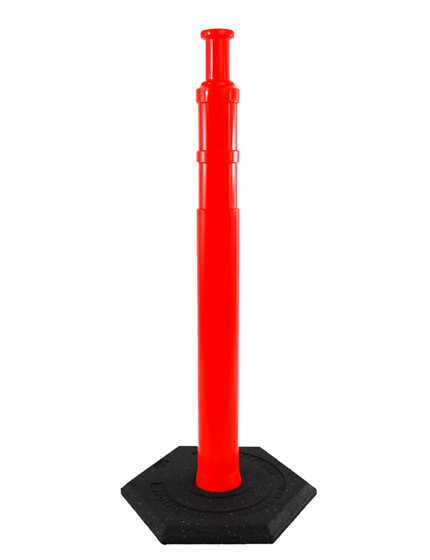 Flat Top Delineator Posts are in stock and ships immediately. 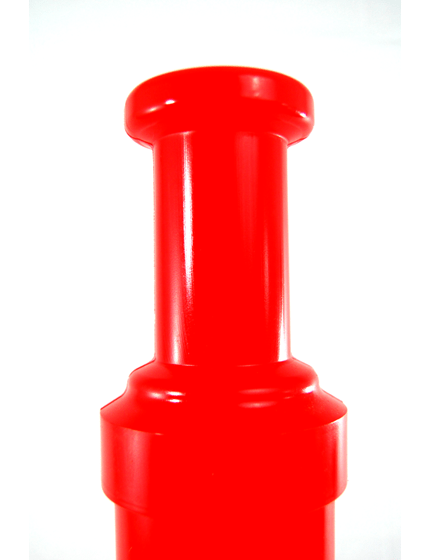 Our Flat Top Delineator Tube is versatile and tough with a built-in grip on top. 42" tall and made from brilliant orange LDPE Plastic (Low Density Poly Ethylene) these delineator tubes have built-in UV stabilizers to prevent fading and keep the orange color bright for many years. This means that your investment will last you longer and help your projects finish on-time and within budget. There is a recessed area in the delineator tube to protect the optional 3" reflective 3M Prismatic Sheeting. Can be used in conjunction with a cone bar to make an easy to set up the barrier. Our 8 lbs. recycled rubber base is a standard 8 lb. rubber base. This recycled rubber base for demanding applications and will withstand a range of weather conditions and normal wear-and-tear that is experienced on a job site and regular use. You can find a full range of high-quality plastic barricades in our store, and one of them is the Flat Top Tubes that are NCHRP-350 certified and have undergone rigorous testing to ensure that it would meet the demands of the user. During emergency situations where you have to enclose or isolate an area as quickly as possible. The patented “loop” style of the Flat Top Tubes makes it easy to grab and move from one place to another. You can quickly set up a pedestrian barrier with these Flat Top Tubes by simply wrapping caution tape from one tube to another. Thus, it's a perfect solution for situations where you have to set up a temporary barricade, such as on the job site or when there's a road work going. With the help of the Flat Top Tube, enclosing an area has never been more convenient and stress-free. Its ergonomic design and the fact that it's lightweight makes it possible for a single person to set up the barrier. Likewise, there's no need to utilize any heavy machinery or equipment either-- all you'll need are these Flat Top Tubes and caution tape. You can also use ropes and ties depending on your preference. These delineator posts available in our store are highly reflective, easy to setup, and easy to maintain. In fact, most traffic experts and roadwork professionals would tell you that our Flat Top Tubes are what you need during emergency situations where a temporary barricade must be set up. Since it's available in highly visible orange and comes with reflective stripes, these delineators posts can easily be spotted even during the night or when the weather is bad. It's perfect for delineating but also works great as a warning device ideal for emergency situations, accidents, sudden roadwork activities, and much more. What Are Flat Top Tubes, Why Should I Be Using One? We always tell our customers that when choosing a plastic barricade, it's essential to opt for one ideal for the project. By doing so, you'll be able to ensure safety and security all throughout the task. This is why the Traffic Safet Store provides the best Flat Top Tubes on the market to help you and your work crews complete your tasks as efficiently and safely as possible. The Flat Top Tubes available in our store are versatile and can be used for some purposes- be it roadwork or a traffic situation. Aside from that, since these barriers are available in different colors, sizes, and shapes, you'll come across one perfect for the job. It's also worth considering that even though all plastic barriers, such as water-filled jersey barriers and traffic cones have the same purpose- to secure or isolate the area. our flat Top Tube barriers are better in a sense that they can be used in areas where you have to notify the pedestrians and motorists about the oncoming traffic, or if they shouldn't even be going near the area. We are fully committed to offering only the best traffic equipment to our customers, and we are very proud to say that the Flat Top Tubes are one of those. It's made from high-quality plastic, giving you the assurance that every penny spent is worth it. These barriers are very flexible and durable that you can use them over and over again. Say goodbye to buying a new one every month or so-- these are a more affordable option. Aside from that, since they can be reused, you'll have them ready for emergency situations. They're easy to move from one place to another, easy to setup, and best of all, highly visible. With so many industrial applications for Flat Top Tubes, it can be difficult to understand the type of Flat Top Tubes you need for your project. The Traffic Safety Store has years of experience helping customers just like you choose the Flat Top Tubes for any project or application.